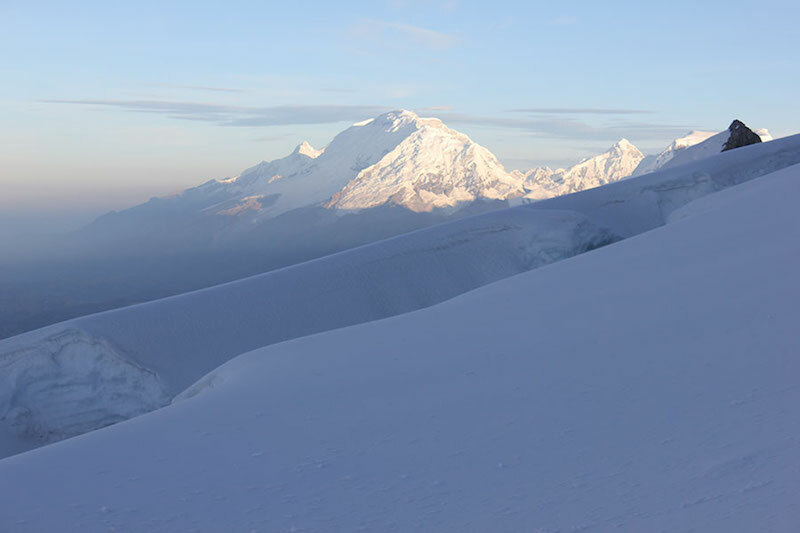 Climb Vallunaraju, a great beginner mountain and one of the few peaks in the Cordillera Blanca that can be climbed from Huaraz in only two days. 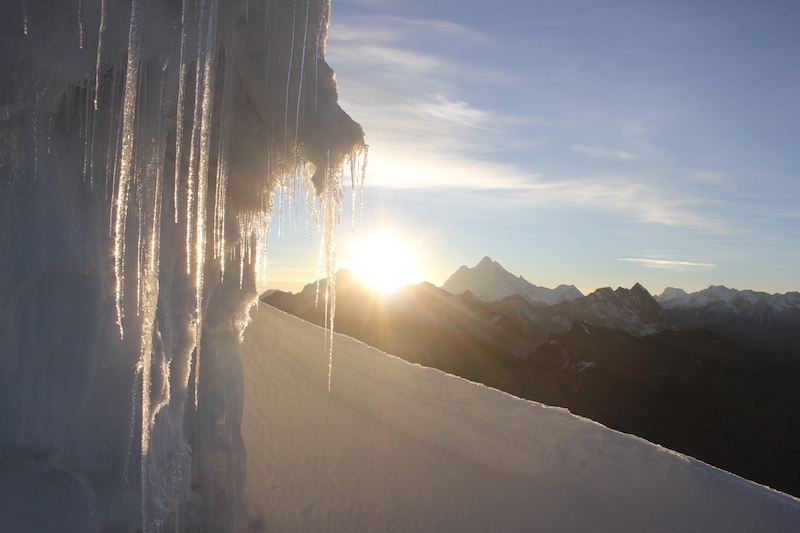 A good peak for beginners or to include at the end of your trek or for acclimatization for climbing bigger peaks. All about the Vallunaraju Climb (5686m). Vallunaraju is one of the few peaks in the Cordillera Blanca that can be climbed from Huaraz in two days. 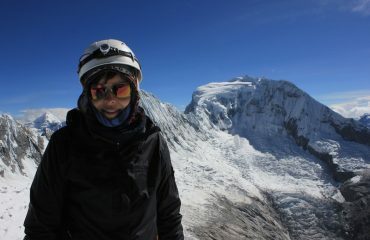 It is suitable for both first time climbers and also experienced climbers. 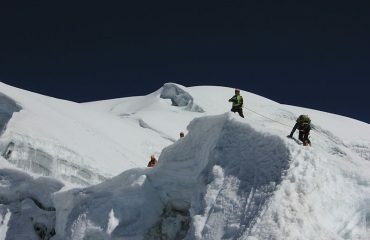 A good peak to include at the end of your trek or for acclimatization for climbing bigger peaks. Although graded as an easy climb, the high altitude and long and in places steep snow slopes do make Vallunaraju a physically demanding climb. 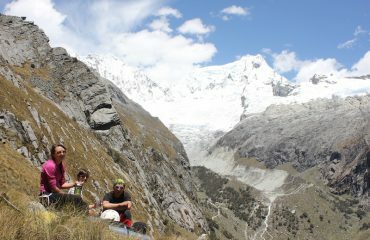 It is also necessary to carry all equipment up to Moraine Camp on the mountain on a steep trail. 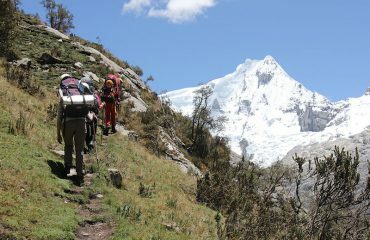 Porters carry tents, food, climbing rope up to Moraine Camp and back, but you need to carry your own personal gear. You are healthy and not afraid of heights. Good fitness and strength is required. You need to be strong enough to carry a moderate-weight backpack up the steep trail. For the fit, strong and well-acclimatized this is a great, challenging adventure. 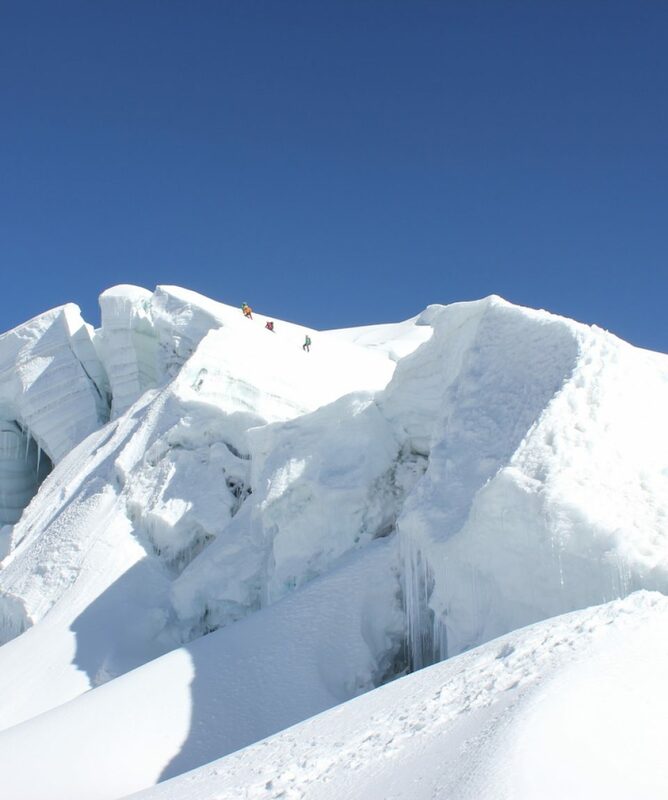 You should not consider this climb unless you have above average fitness and are generally strong. 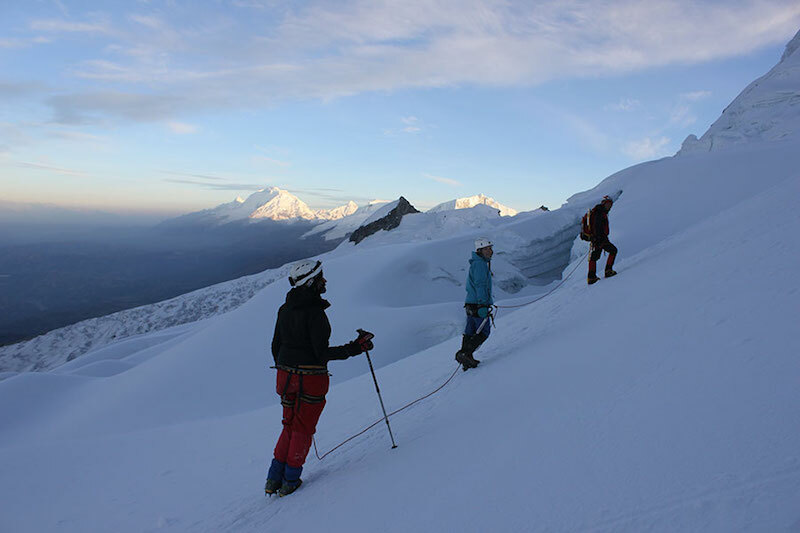 It is important that you are well acclimatized to the altitude before attempting to climb any peak. Thus avoiding any potential problems with lack of energy or any altitude-related illnesses when climbing. Climbing above 5000m is physically demanding, even when the climbing itself is not steep or technical. 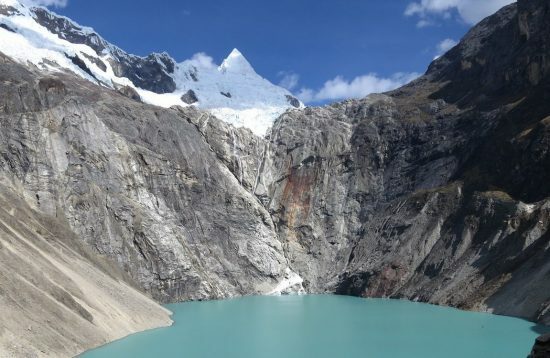 On this ascent you go from Huaraz (3090m) directly to the Moraine Camp (5130m), constituting an altitude gain of 2014m in a single day. It is therefore extremely important that you are already well acclimatized. 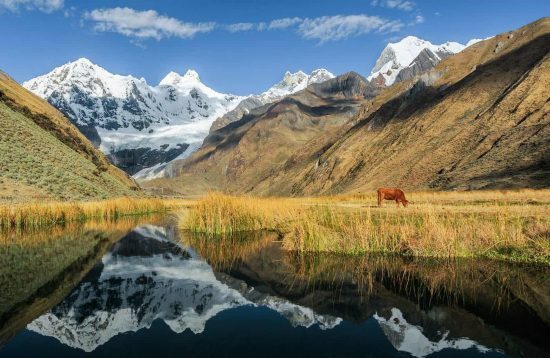 We always recommend a trek of minimum 4 days for acclimatization and extra fitness. 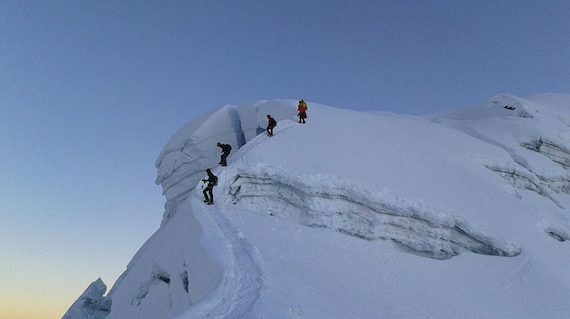 This climb can be booked all year around. 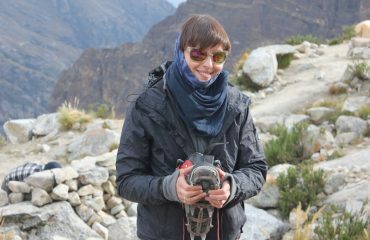 The best climbing season in the Andes is from April to October, with rainy season in between. It is usually sunny and warm during this time. Due to the altitude, the nights can be quite cold (to minus 5 ° C). 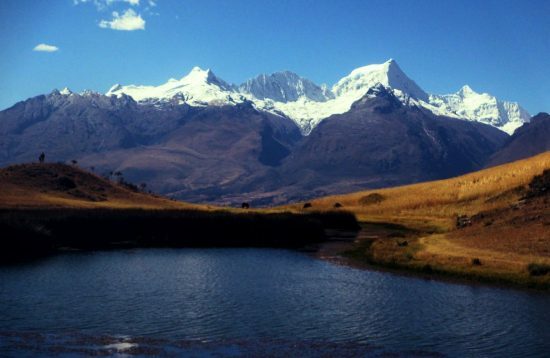 From Huaraz we drive 1.5 hours to the Llaca Valley (4350m). 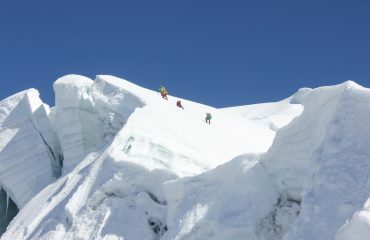 Then we climb steeply up a ridge for 2 to 3 hours to Moraine Camp (4760m). 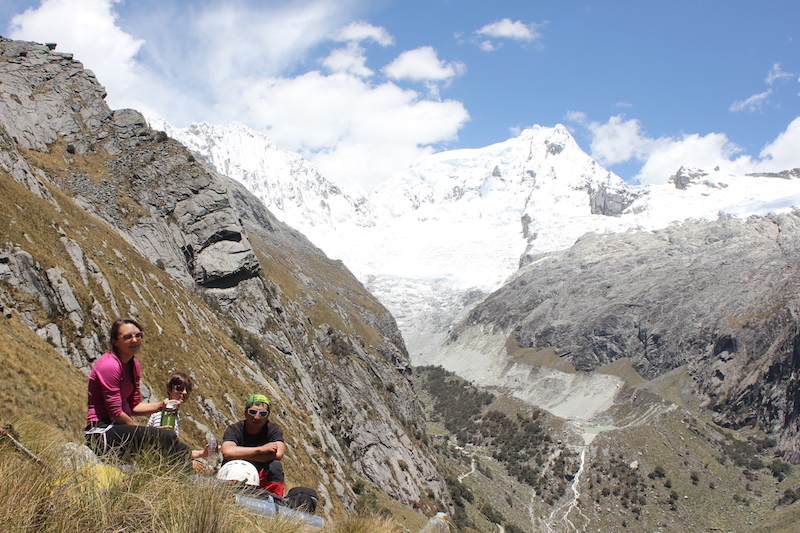 During this hike we will see mountains in the east site like San Juan, Ranrapalca, Ocshapalca, and Leon Dormido. Early in the morning around 4:00 am we start a short climb over the rocks for about 25 minutes to get to the beginning of the glacier. We put on our climbing gear and climb around 4 hours up. 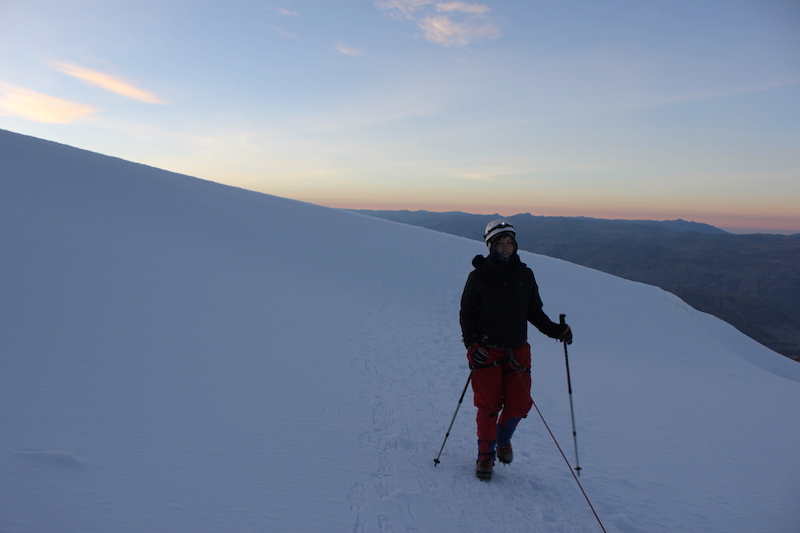 A steady and not steep on good snow slopes towards the summit (5686m). The last 60m is steeper and will feel exposed – the guide will help you with this. After enjoying the views and taking pictures, we go back down to the Moraine Camp (4760m) for about 2 hours. 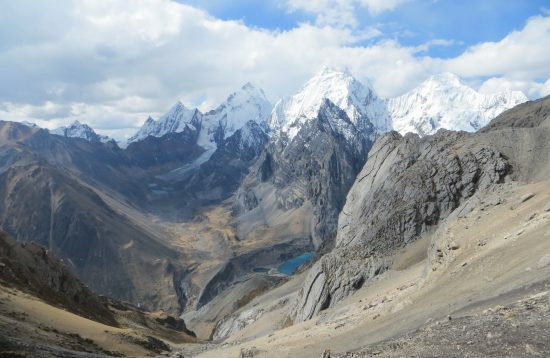 Then we return back to the road in the Llaca Valley and drive to Huaraz. Please read carefully through the required equipment list. 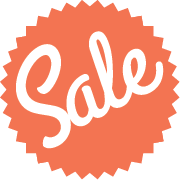 Missing equipment can be rented from us to a reasonable price. You will review your gear again with your guide before climbing Vallunaraju. 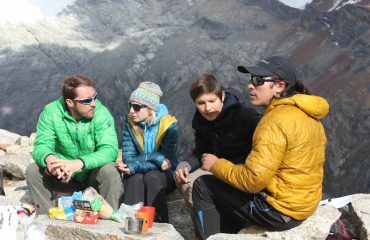 During the climb we pay attention to a healthy and high-calorie diet. For lunch, a box lunch is served. We can prepare vegetarian dishes on request. We use minivans or comfortable 4×4 off-road vehicles, depending on the group size to get to Vallunaraju Basecamp. 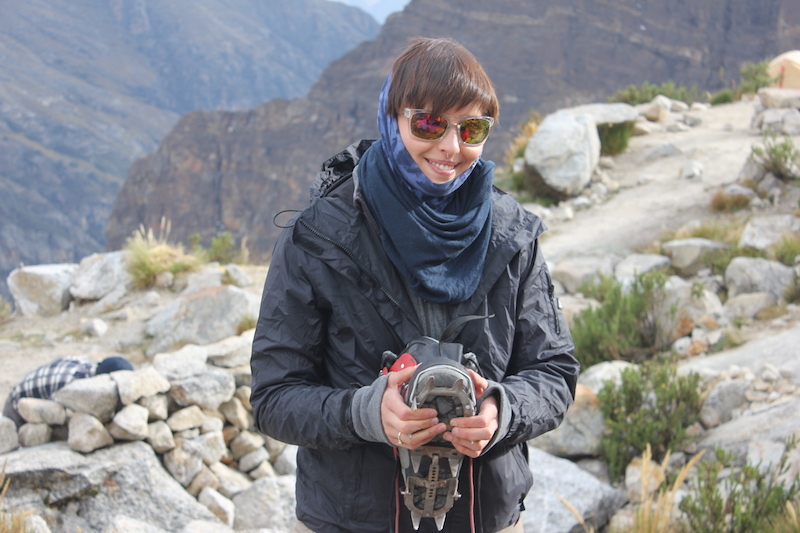 It is necessary to carry all equipment from the vehicle up to Vallunaraju Basecamp. The way up to the camp is a dirty and rocky trail which is steep and demanding for about the first two hours. Our crew carry the tents, food and equipment, but you need to carry your own personal gear (and must have a backpack large enough for this). 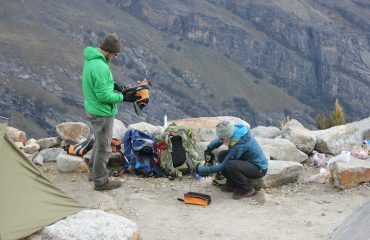 Our crew will carry as much of your climbing gear as they can manage. 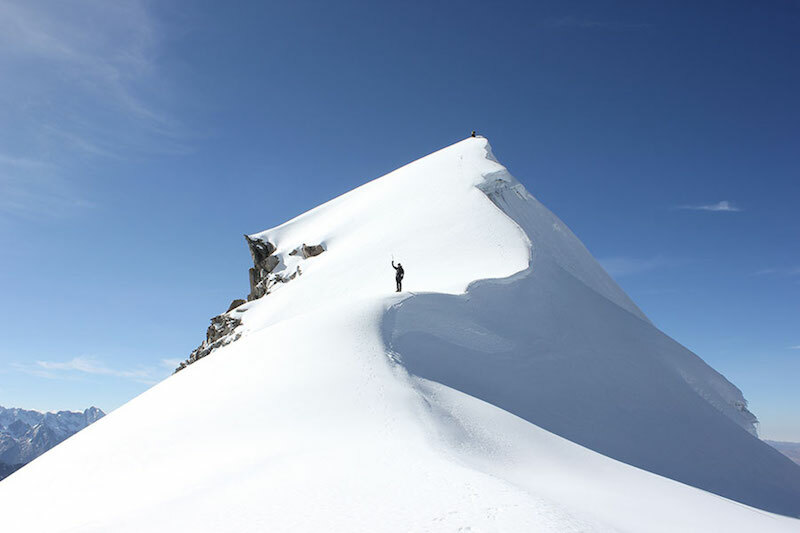 How heavy is my backpack for this climb?Can I leave my extra bags and valuables with you while we are in the mountains? How heavy is my backpack for this climb? Can I leave my extra bags and valuables with you while we are in the mountains? 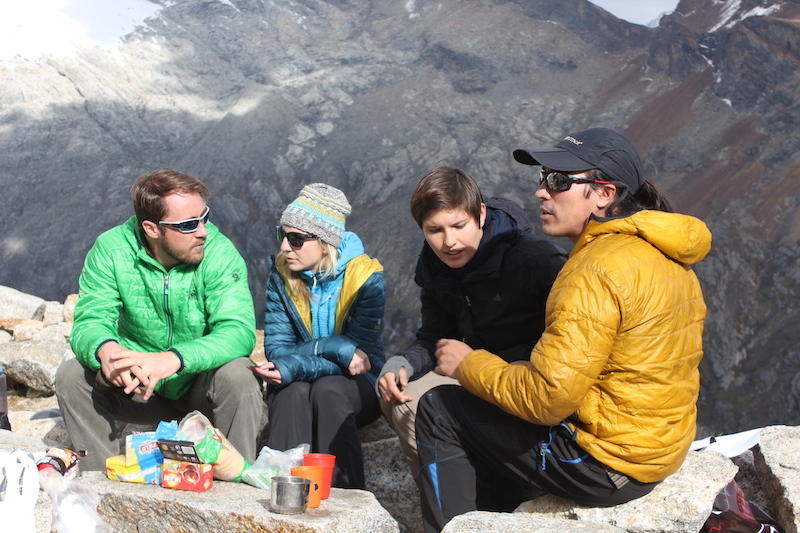 When walking out to moraine camp, you will need to carry around 15kg which includes personal gear and some food. Your guide will be checking the contents of your pack before you leave the office on your climbing day. Yes, no problem. We have storage for anything you aren’t taking on your climb. Vallunaraju Climb Vallunaraju Climb in Huaraz, Peru. 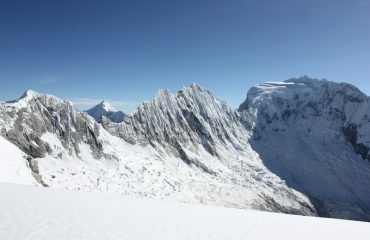 Vallunaraju Climb Vallunaraju Climb (5686m) in Huaraz, Peru.